Ideal with meats or salads. Made with only the finest tomatoes and vegetables. Diced Tomatoes (59%), Sugar, Onion, Vinegar, Tomato paste (4%), Starch, Salt, Mustard Flour, Spices. 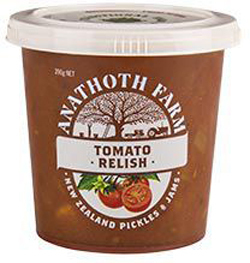 We first tried this tomato relish while visiting our son in Melbourne. We brought 5 tubs back with us in our luggage, it was so good. When we found out we could get it from Sanza we were delighted. It is a superb relish & we have not found anything as good as this anywhere. We could not get enough of this relish when we were in Oz. It is gorgeous. We even brought some back in our luggage! So delighted we can now get it in the UK. We have ordered some now but will be stocking up with more very soon.